When I was small, growing up in Wisconsin, I loved to walk along the railroad tracks. As I walked, I would watch the steel rails grow from a point in the distance ahead of me, sweep around me, and then disappear again in the distance over my shoulder, converging slowly back to a point. The pure geometry of it was breathtaking. What impressed me the most, however, was the powerful metaphor that it suggested: How wide the present seemed, simply because of my presence there; how small the future and the past. And yet, I could move along the tracks, imagining myself expanding and contracting the infinite timeline of history. I could move ahead until any previous place along that continuum had shrunk to insignificance, and I could, despite the relentless directionality that I imagined moving along the tracks like so many schedule-bound trains, drift backwards as easily as I could let myself be carried forward. Sometimes I would just stop. I would crouch down in some nondescript other time and widen the place out for a closer look. It seemed marvelous how uniquely full of life anywhere could be. There would be solitary, wandering insects that I never would have noticed if I had not stopped in just that place. There would be pungent, localized smells — of plants, and animals, and the liquids that dripped from the passing trains. Sometimes, scattered among the cross-ties, I would find things that had been dropped and forgotten there. I found twisted spectacles and cigarette stubs spotted with dark lipstick. I found old pieces of machinery whose greater mechanisms I could only imagine. I once found a crumpled notebook page that had scribbled on it only “don’t forget.” These objects may have been ordinary, everyday things when they had been lost, but now their mute presence gave there its poignancy. I went on to spend my undergraduate days at MIT, whose long corridors reminded me more than a little of the railroad tracks that I had left behind in Wisconsin. At night, the corridors were usually empty, and I felt at home as I walked along them, watching the walls expand and contract. There were places where laboratories were filled with incomprehensible collections of equipment, where bulletin boards were posted with pages of beautiful scribbles, and where doors stood ajar to dimly lit offices in which old men pored over stacks of scattered paper. Walking those corridors, I was filled again with the idea that I could stop anywhere and find something worth exploring, even if it was just following the cracks in the wall. The metaphor grew richer for me: History was the line that I kept traveling, and the stops and starts that I chose to make were going to decide what I would learn about the world. Any place and any time could be expanded and examined, and if I could only learn to appreciate the local geometry, anyplace and anytime would have hidden stories to tell. One night, my wanderings took me to the cases of mathematical models that lined the corridors of the Mathematics Department. I had no particular plans to study mathematics at the time — I was going to be an astronomer. And yet, I paused there much longer than usual, drawn in by the stark dignity that the models maintained beneath their old brown bulb; taken, finally, by the unspeakable complexities that their forms suggested. The models cast a spell on me. I came back to that same place, night after night. I stood there and stared. The models, it said, were surfaces. I walked along the surfaces with my eyes, feeling the slip of the varnish and the softness of the unraveling strings. I pronounced their incredible names, clicking off each harsh progression of syllables with my tongue: Hyperbolic Paraboloid of Two Sheets, Helicoid of Constant Striction, 24-Cell. When I went home I dreamed about them, about walking among them, as if I were lost in the maze of some foreign city whose streets wound through each other without end and whose buildings held an infinity of dark secrets. It was a place where I could get lost, always be lost, yet thrill to the tug of perpetual anticipation. I became a mathematician, of course. Not a geometer, but a logician — at least that is the pedigree I inherited during my graduate education. I’ve wondered about that choice many times. Not about being a mathematician, for I can’t imagine being anything else, but about choosing logic over geometry. What made me leave behind the soft curves of the geometric models, nestled in their velvet display cloth and incandescent half-light, for the razor sharp lines and fluorescent lighting of the weekly logic seminar? I thought in those kinds of images, and I felt that I made the choice consciously: I wanted to live in the daylight; I wanted order. There is something very personal in trying to understand that decision, but it is a personal version of something more universal: trying to understand the mathematical structures that we all impose on a non-mathematical life. Suffice it to say that I went on to find geometry in other places. I came to the University of Arizona in the fall of 1994, and one of the fist things I noticed was the Math Department’s display of mathematical models. It looked very neglected. There were some things in it that I had never seen before, some fantastic things, and yet students and faculty seemed to skirt around the display without ever giving it a glance. It was there, but no one was stopping. It was lost. I too viewed the display mostly in passing: It had been a long time since my romance with the models at MIT, and I was busy with new business. Nevertheless, the display pulled me in with an old, familiar spell. I found myself dreaming of surfaces again, but this time they were covered deeply with dust, and I moved through them like a character in an Edgar Allan Poe story. The models at the University of Arizona as they appeared ca. 1995. There seemed to be something a little sad about the U of A’s collection, back then. The models were not, in general, of the finest quality. Many of them, you could tell, had been constructed by students whose mathematical enthusiasm did not quite translate to their hands. Several of those models were in the process of self-destructing, or had long since done so. There were also many commercially produced models, slick and smooth, but they were mostly of very simple surfaces and polyhedra, and the comical pretense of applying such high production values to such elementary ideas made them seem quaint. Other models were of indeterminate origin. Some of them seemed to represent the most arcane geometric propositions in the display, but their bases were covered with clumsy layers of thick paint, and their curves strove for an unfulfilled elegance. It was as if their deepest desires could not quite be verbalized. I began to imagine that the spell the case was casting on me was only the meek collective voice of the models, asking to be told their story. I had to admit: They were curious. ...these models were here before I came (1958) so I can not give you much information on them. I recall that when I quit as head of the department (1967) there was a general feeling of euphoria on the demise of the ancient regime, and the past history was mostly obliterated. I am therefore pleasantly surprised that when the natives became revolting they did not also destroy the artifacts. Harvey Cohn was the first to tell me the story, which I would hear repeated in various versions, with fingers pointing in various directions, that a secretary had thrown away all of the documentation for the models in a fit of “spring cleaning.” Others in the department assured me that the story was apocryphal. The documentation, nevertheless, had disappeared. Whatever threads still connected the models to their past had obviously grown very tenuous. Like the deteriorating threads that wove some of the older string models into promises of higher geometry, many of the threads that I attempted to follow backwards into the past evaporated when they were scrutinized too closely, leaving only an enigmatic puff of dust. Harvey Cohn had suggested one such tenuous thread, writing, “incidentally,” that “some of the models were collected by Charles Merchant, my administrative assistant.” When asked, a number of people in the department remembered Charles Merchant. He had, during Harvey Cohn’s tenure in the 1960s, been a lecturer in the department as well as an administrative assistant. There was agreement among those who remembered him that he could have helped assemble the models; perhaps even constructed some of them. Charles Merchant was, apparently, a very good draftsman, with an appreciation for quality craftsmanship. John Leonard, however, was skeptical about his contributions: “I’d never heard of Chuck Merchant being involved with the models,” he said. Still, he felt obliged to add: “It’s not impossible.” This was the general assessment of Charles Merchant that emerged from several discussions. Details were always blurred, however, and they were layered with oblique references to the many moods of Charles Merchant’s personality. Still, Richard Thompson called him a “Renaissance man,” though one who had “never mastered advanced mathematics.” John Leonard said that “Merchant was very interested in sundials, and published an article about them in Scientific American.” The bits of information moved in an enigmatic cloud. Whoever he may have been, and whatever the models may have meant to him, something of Charles Merchant probably remains among the models and calculating machines in the U of A’s collection. The thread, however, appears to have disintegrated. While discussing Charles Merchant, another name — Joe Foster — came up many times. Joe Foster had been an instructor in the department from 1942 until 1969. He had degrees in both mathematics and astronomy, and, apparently, quite an interest in both the models and the calculating machines. During World War II he had taught spherical trigonometry and the principles of navigation to the university’s ROTC students. The models, by several accounts, were a regular presence in his classes, and it seems likely that during his time with the department he was the primary caretaker of the collection. In fact, he seems to have enlarged it. His legacy, however, is as enigmatic as that of Charles Merchant. Richard Thompson remembers that Joe Foster would have his students build models to be displayed in the case, but only as a kind of redemptive punishment for performing poorly in his classes. However well-intentioned, one wonders what kind of models might have been produced under such circumstances. None of the models currently in the collection show any obvious markings of having been produced for, or by, Joe Foster. There are some likely candidates, however, such as the many tedious repetitions of cardboard polyhedra that were piled high on top of the display case for many years. Of the remaining, more unique home-made models in the case — and there are quite a few — we don’t know which ones might be a product of Joe Foster’s inspiration. It is fun to guess, however. I stare at some of the possibilities, and try to imagine the character of the student whose response to this kind of “punishment” is still witnessed by the eloquently tortuous design of the model that they have left behind. Except for the models that were produced by his students, no one remembers Joe Foster ever talking about obtaining new models for the collection — only of “using” the ones that were already there. And so the origins of the department’s collection, at least the department’s collection of commercially produced models, slipped further into the past: Before World War II, and beyond the reach of even the most tenuous threads of the department’s oral history. Alaina Levine, the undergraduate mathematics major who is responsible for putting this catalogue together, checked through old university bulletins to see if the models might have been mentioned in earlier course descriptions (in mathematics, engineering, or art), signaling the date of their arrival on campus. Alas, there was nothing there, and the light looking backwards through the tunnel seemed to blink out. This is when John Brillhart cheerfully started sharing his books with me. John seemed to know quite a lot about the early history of research universities in the United States, and his suggestions hinted gently at a small piece of wisdom: When trying to solve for X, Y, and Z, it is helpful to know your ABCs. Those readings, among many others to be discovered as the inter-woven threads of history are followed backwards through library books, dusty journal articles, microfilms, and inter-library loans, are included in the bibliography at the end of this catalogue. In the stories that are told there, the particular threads leading up to the U of A’s collection of mathematical models unwind backwards into an historical past; and the past moves forward, inevitably, to describe the weave of the present. If one is comfortable moving back and forth along the timeline, it is possible to tie together some of the threads, and something of a greater story begins to emerge from the metaphors. Nineteenth century America, I learned, had been swept up in one educational reform movement after another. All of those movements, however, seemed to share a common prescription for what was ailing the public schools: Buy mathematical models! Early in the century, sets of mathematical models, sold by catalogue, provided a way for the newly established common schools to feel as if they were participating in a common curriculum. Throughout the rest of the century, the market for these models was maintained with fervent calls for, successively, “Object-Oriented Instruction,” “Technical Training,” “Art Education,” and “Exact Thinking.” Many of the advocates of these “object-oriented” pedagogies, and the “ocular demonstrations” on which they relied, were the very same people who were producing the models. They sat on local school boards and they supervised instruction for entire regions of the country. Business was so good that it diversified into much more lucrative catalogues of “Mathematical Apparatus,” which included everything from finely-crafted orreries and tellurians to the latest in elegant “Pointing Rods.” There was definitely money to be made in the boom market for models, and before the century was over the Gilded Age had left its mark on schools and universities across the country. In America, it has always been difficult to just buy something — inevitably, it comes packaged with ideas, attitudes, and suggestions which are meant, whole-heartedly or cynically, to enhance the purchaser’s use, understanding, and enjoyment of the product. So it was with the educational business of the nineteenth century, and so it remains today. It is difficult to sort out, as one looks at various places and times in nineteenth century America, whether the educational reform movements were driving the model business, or whether it was the other way around. America has always had as many demagogues as do-gooders, and history can’t always tell them apart. A case in point was W. W. Ross, who served as a superintendent of public schools in northwestern Ohio for forty-two years in the late 1800s. He was, at various times, president of the Ohio State Teacher’s Association, president of the Tri-State Teacher’s Association for Ohio, Michigan, and Indiana, and president of the Ohio State Board of Examiners. He also made and sold mathematical models. Ross’ specialty was wooden models that could be dissected to show how the familiar formulas for areas and volumes in plane and solid geometry could be constructed from simpler pieces. His model designs developed into elaborately hinged production numbers that were sure crowd-pleasers. Yet Ross was undoubtedly more than just a shrewd manipulator of the educational market. He earnestly covered his otherwise beautifully crafted models with detailed explanations, in tiny print, and then gave them a heavy shellacking for the ages. He spoke with conviction of his belief in “object-oriented” instruction, arguing that the use of models was the only way to make the formulas of geometry “the permanent property of the reason rather than the uncertain possession of the memory.” In a tack that was sure to generate opponents and hurt his sales, Ross claimed that his “ocular demonstrations” were more valuable to students than formal proofs. Nevertheless, business was doing quite well. The annual report of the Ohio state commissioner for the common schools showed regular, significant expenditures on apparatus during the period that Ross was promoting his ideas. His models eventually began to show up in more prestigious colleges and universities outside of Ohio: Hood College in Maryland, Wesleyan University in Connecticut, and, sure enough, the University of Arizona. How the models came to be at the U of A, who might have purchased them, and what educational reforms members of the department may have believed in, passionately or dispassionately, is unknown. But there they are. I stare at them and can almost hear the opposing faculty members not talking to each other. By the end of the 1800s, the model business had shifted its attention to the country’s emerging colleges and universities. University mathematics departments in the United States were still very focused on teaching, and the American research community hadn’t really developed yet. As in the common schools, a fine set of models, proudly displayed, could provide instant educational cachet for a department: They said that the faculty were up-to-date with the latest mathematical discoveries and the most progressive educational trends. Many faculty believed in the inherent instructional value of the models, as well, and this belief became more widely-spread as the century progressed. The basis for this belief — that mathematical models could help to develop essential intuition about difficult analytic constructions — was not manufactured to sell models. It had originated in the early part of the century with Gaspard Monge in France, and was promoted later in the century by Felix Klein in Germany. Both mathematicians were active participants in the mathematical developments of their era, and they began their model-building careers by trying to visualize the astonishing new discoveries that were then being made in geometry and analysis. Over time, however, they came to appreciate the wider role that models could play in graduate education. Each of them would promote their own version of “object-oriented” pedagogy within the mathematical community, and together they would initiate an educational reform movement in the universities and technical colleges that would set the standard for the way that mathematics was taught in both Europe and America. Monge, of course, is known as the father of differential geometry, and his efforts in the early 1800s to classify surfaces by the motions of lines, along with his “descriptive geometry” for representing three-dimensional surfaces in two-dimensions, led naturally to the construction of elaborate models made of tightly stretched strings. One of his students, Théodore Olivier, built some of the most beautiful mathematical models ever made — and made some money in the process. The models were expensive. He sold his models to the emerging technical schools in the United States, which were doing their best to emulate the example of Monge and the École Polytechnic. Klein came along later in the century, making it his special mission to promote the use and construction of mathematical models in graduate education, and the first research universities in the United States once again did their best to follow the European lead. Klein and his colleague Ludwig Brill established a Laboratory for the Construction of Mathematical Models in Munich, and the labors of their graduate students were sold world-wide. The prices, once again, reflected America’s awe of European craftsmanship. Eventually, the spell of the mathematical models lost its hold on the mathematical community. Economic realities in the early part of the 20th century made their acquisition an increasingly difficult proposition, and the market for finely-crafted models, as well as the finely-crafted theories of education that went with them, fell off. Educators returned to an emphasis on “fundamental skills,” and the misguided “over-emphasis” on mathematical models and visualization was triumphantly discredited by those who had always been disciples of a more Cartesian discipline in mathematics education. Model makers, at least what was left of them, sensed the shift in the market, and the more enterprising ones jumped in with cheap knock-offs of the European models. For a while, they were able to supply the diminishing demand. The increasingly clumsy constructions could no longer capture the mathematical community’s collective imagination, however, and dust began to settle on the country’s collections of mathematical models. It is from this twilight era of the golden age of mathematical models that we are able to pick up a final thread that leads forward again to the models in the display case at the U of A; and leads me, backwards, to a new appreciation of my boyhood fascinations at MIT. This is the thread: “R. P. Baker,” in an inelegant script, like something from a scrap of paper along the railroad tracks. It is painted on a large number of models in the U of A’s collection. Who was s/he? A student? A faculty member? Both seemed like good guesses, for the models, though they were of more ambitious design and generally higher production value than the majority of the models in the case, still seemed too clumsy to have been produced commercially. They were odd. The models that showed the maker’s mark most clearly were an obsessive sequence of plaster surfaces, each one only slightly different from the next, as if the maker had been struggling with an ideal form that had taken shape in their head, but could not quite realize it. Whatever mathematical form may or may not have been captured, the struggle certainly was. The surfaces were bolted to pieces of plywood with big screws, holes showing where previous attempts at attachment had failed, and the bases were covered thickly in paint, as if to erase the memory of those failed attempts. I was moved by the single-minded pursuit they displayed, in the face of what was obviously a less-than-German self-confidence. These, I thought, are the models my students should ponder. It was in the course of reading an article by Peggy Kidwell, the curator of mathematical models at the National Museum of American History at the Smithsonian Institution in Washington, that I found out R. P. Baker’s true identity — at least, the relevant names and dates that often pass for true identity in historical accounts. Richard P. Baker (1866-1937) was an Englishman, educated at Oxford and the University of London. Around the turn of the century he moved to Chicago, apparently with the idea of becoming a player in the burgeoning university model-making business. His first catalogue, in 1905, contained descriptions of 100 models, which he hoped to craft in a made-to-order fashion that would set him apart from the other model-makers and their standardized collections. Some of his more exotic offerings included Riemann surfaces, surfaces from the theories of optics and thermodynamics, and representations of statistical distributions. Something changed his plans, however — either a lack of business or an unsatisfied desire to realize the forms in his catalogue descriptions — for he soon accepted a teaching position at Iowa State University and took up graduate studies in mathematics, at a distance, at the University of Chicago. He completed his Ph.D. in 1910, but remained devoted to model-making for the rest of his life. Ambitiously, he tried to compete with the Germans. The outbreak of WWI must have been good for business: because of the disruption in shipping, but also because of America’s souring attitude toward Germany. By 1931 his catalogue had mushroomed to over 500 offerings. Unfortunately, his ambitions were rising just as the stock market was crashing. Baker was nevertheless able to realize almost 300 of his conceptions before he died. I learned all of this from Peggy Kidwell at the Smithsonian. She was very interested to learn that the U of A had a collection of Baker models. She knew of only a few collections in the East, at Brown University and at the Smithsonian itself, and was unaware of any such collections in the West. When Alaina Levine put pictures of the U of A’s entire collection of models up on the Web, Peggy Kidwell was able to confirm that many of the other models — particularly, many of the string models — were also Baker’s creations. It seems that the U of A has a fairly large and uncommon collection of objets from one of America’s last truly inspired model-makers. One of the most satisfying outcomes of finding, and telling, the story of the Baker models was having the Smithsonian provide the department with a replacement copy of its “lost” catalogue: The 1931 edition gives Baker’s description of every one of models in the U of A’s collection. It made me happy, to tie together a thread so nicely, but it also, ultimately, made me feel as if I had lost something. I had stared with such wonder at those surfaces, when I finally noticed them. Now their subtle variations were “explained” by a changing parameter in the Fresnel equation. I knew I had to recognize the necessity of that: That’s math, order, what we call history. It is also what catalogues are all about. I had found exactly what I had sought. I didn’t regret it, it just made me feel older somehow. I smiled when, later on, Peggy Kidwell wrote to tell me that one of the largest collections of Baker models had been exhibited for “many years” at MIT, and now “survives” at the Smithsonian. It is time for me to move on. The U of A’s display case is going through the process of a complete re-furbishing, and the models will be displayed with a renewed dignity for some time to come. I hope, though, that students will continue to press their noses against the glass. I hope that they will read the new information about the models’ origins and realize that there are still a myriad stories to tell. I hope that the models will speak to them, in the remarkable language of mathematics, which has cast its spell up and down the timeline of history. I hope they will wonder. I know it has taken me a long way. 1. R. P. Baker, Mathematical Models, Iowa City, 1931. 2. D. Bressoud, A Radical Approach to Real Analysis, The Mathematical Association of America, Washington, D. C., 1994. 3. F. Cajori, Mathematics in Liberal Education, Christopher Publishing, Boston, 1928. 4. ________, The Teaching and History of Mathematics in the United States, Bureau of Education, Government Printing Office, Washington D. C., 1890. 5. H. S. M. Coxeter, Regular Polytopes, Dover Publications, Mineola, NY, 1973. 6. ________, P. DuVal, H.T. Flather, and J.F. Petrie, The Fifty-Nine Icosahedra, University of Toronto Press, 1983. 7. T. Everard, Stereometry, Or, The Art of Gauging Made easie by the Help of a New Sliding-Rule Which Shews the Area's of Circles in Gallons and Barrels and the Square and Cube-Root of any Number under 100,000 by inspection; and also Resolves Many other Arithmetical Problems Without Pen or Compasses: With an Appendix of Conick Sections, in Which the Nature and Original of Several Solids (frequently mentioned in Books of Gauging) is Explained, and their Magnitudes Compared, Peacock, London, 1689. 8. H. Eves, An Introduction to the History of Mathematics, Saunders College Publishing, Philadelphia, 1983. 9. J. Ewing, ed., A Century of Mathematics Through the Eyes of the Monthly, The Mathematical Association of America, Washington, D. C., 1994. 10. S. Greenblatt, Marvelous Possessions: The Wonder of the New World, University of Chicago Press, Chicago, 1991. 11. H. Hahn, The Crisis in Intuition, in The World of Mathematics, Simon and Schuster, New York, 1956. 12. W. Hawney, Hawney's Complete Measurer, or, the whole Art of Measuring: Being a Plain and Comprehensive Treatise on Practical Geometry and Mensuration: Preceded by Decimal and Duodecimal Arithmetic, and The Extraction of the Square and Cube Root: Adapted to the Use of Schools and Persons Concerned in Measuring, Gauging, Surveying, &c., Cochran and McLaughlin, Philadelphia, 1801. 13. J. Henle, Classical Mathematics, this MONTHLY 103 (1996) 18-29. 14. D. Hilbert and S. Cohn-Vossen, Geometry and the Imagination, Chelsea Publishing Company, New York, 1952. 15. J. Holbrook, Apparatus Designed for Families, Schools, Lyceums and Academies, Allen and Ticknor, Boston, 1833. 16. O. Impey and A. Macgregor, eds., The Origins of Museums: The Cabinet of Curiosities in Sixteenth and Seventeenth Century Europe, Clarendon Press, Oxford, 1985. 17. A. Jackson, Mathematical Treasures of the Smithsonian Institution, Notices of the American Mathematical Society, 46 (1999) 528-534. 18. P. S. Jones, ed., A History of Mathematics Education in the United States and Canada, National Council of Teachers of Mathematics, Washington, D.C., 1970. 19. M. Joswig, K. Polthier, eds., Electronic Geometry Models, http://www-sfb288.math.tu-berlin.de/eg-models, 2003. 20. C. Kapetanya, unpublished, untitled draft of a dissertation on Geoffrey Thomas Bennett, University of Cambridge, 2003. 21. J. Kenseth, ed., The Age of the Marvelous, Hood Museum of Art, Hanover, New Hampshire, 1991. 22. P. Kidwell, American Mathematics Viewed Objectively: The Case of Geometric Models, in Vita Mathematica, The Mathematical Association of America, Washington, D. C., 1996. 23. S. G. Kohlstedt, Parlors, Primers and Public Schooling: Education for Science in Nineteenth Century America, Isis 81 (1990) 425-445. 24. A. Lugli, Inquiry as Collection: The Athanasius Kircher Museum in Rome, Res 12 (1986) 109-124. 25. A. M. Luyendijk-Elshout, Death Enlightened: A Study of Frederik Ruysch, Journal of the American Medical Association 212 (1970) 121-126. 26. N. Luzin, Function: Part I, this MONTHLY 105 (1998) 59-67. 27. A. MacGregor, ed., Tradescant's Rarities: Essays on the Foundation of the Ashmolean Museum, 1683, with a Catalogue of the Surviving Early Collections, Clarendon Press, Oxford, 1983. 28. P. Mauries, Cabinets of Curiosities, Thames & Hudson, London, 2002. 29. 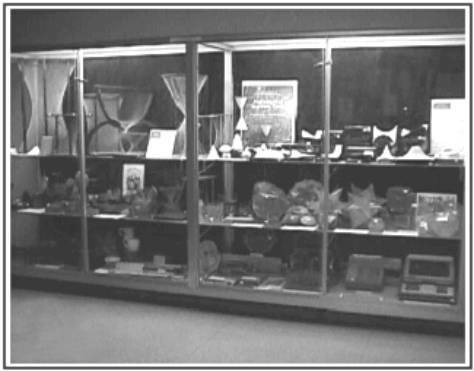 W. McCallum, ed., Mathematical Teaching Tools in the Department of Mathematics at The University of Arizona, http://www.math.arizona.edu/~models, 1998. 30. R. McCarney, The Evolution of Mathematics at Hood College, unpublished article, 1993. 31. W. Mueller, Book Review: Fragments of Infinity: A Kaleidoscope of Math and Art, by Ivars Peterson, this MONTHLY 110 (2003) 248-254. 32. ________, Mathematical Wunderkammern, this MONTHLY 108 (2001) 785-796. 33. ________, Reform Now, Before It’s Too Late!, this MONTHLY 108 (2001) 126-143. 34. R. P. Multhauf, ed., A Catalogue of Instruments and Models in the Possession of the American Philosophical Society, American Philosophical Society, Philadelphia, 1961. 35. K. H. Parshall, D. E. Rowe, The Emergence of the American Mathematical Research Community, 1876-1900: J. J. Sylvester, Felix Klein, and E. H. Moore, The American Mathematical Society, Providence, 1994. 36. _______, Embedded in the Culture: Mathematics at the World's Columbian Exposition of 1893, The Mathematical Intelligencer 15 (1993) 40-45. 37. B. Pascal, Oeuvres complètes, Gallimard, Paris, 1954. 38. W. D. Reeve, ed., Multi-Sensory Aids in the Teaching of Mathematics, Bureau of Publications, Teacher's College, Columbia University, New York, 1945. 39. D. L. Roberts, Albert Harry Wheeler (1873-1950): A Case Study in the Stratification of American Mathematical Activity, Historia Mathematica 23 (1996) 269-287. 40. _______, Selected Bibliography on Geometric Models, Visualization, and the Teaching of Mathematics, unpublished bibliography, 1992. 41. W. W. Ross, Mensuration Taught Objectively with Lessons on Form, Freemont, Ohio, 1891. 42. A. Seba, Cabinet of Natural Curiosities, Taschen, Köln, 2001. 43. B.M. Stafford and F. Terpak, Devices of Wonder, Getty Research Institute, Los Angeles, 2001. 44. J. J. Sylvester, James Joseph, Presidential Address to the mathematical and physical section of the British Association for the Advancement of Science, Exeter, 1869. 45. A. Vierling, Models of Surfaces, http://math.bu.edu/people/angelav/projects/models/summary.html, 2001. 46. D. J. Warner, Commodities for the Classroom: Apparatus for Science and Education in the Ante-bellum America, Annals of Science 45 (1988) 387-397. 47. L. Weschler, Mr. Wilson's Cabinet of Wonder, Pantheon Books, New York, 1995. I was told that a department head from the 1940s — Greyson — might still be living in Tucson, but I was unable to track him down. A third name — Roy Whitman — was mentioned a few times. He may have constructed some models for the case in the 1970s, but I was unable to find much information about him. He said that he learned this “trick” from an older faculty member, but the name of that more distant predecessor seems to have been forgotten. Most of these have now been moved to the math education classroom for future teachers to contemplate. Not unlike the “transformer” toys so popular with children in recent years. They probably arrived in the late 1890s, when Ross was going national with his business. Most of the “dissertations” of this era were solutions to calculus problems. I wonder if Joe Foster’s students felt as if they were weaving the thread of this once powerful tradition into the present or if they were being waved from its frayed ends. In fact, I did this quite literally when I re-strung one of Baker’s models. Many of the string models in the collection have deteriorated badly over the years, and could use this kind of attention. I recommend it to anyone with the patience to appreciate, on the scale of a needlepoint, the inspirations and miscalculations of Baker’s designs.